SIX wheelbarrows full of this stuff is one year’s worth of growth!! The muscadine grapevine is a hearty Southern native that produces wonderful, juicy fruit. On our farm, we are fond of the grapes because they can produce exceptional jam…and I love to juice them and add the nectar to smoothies. 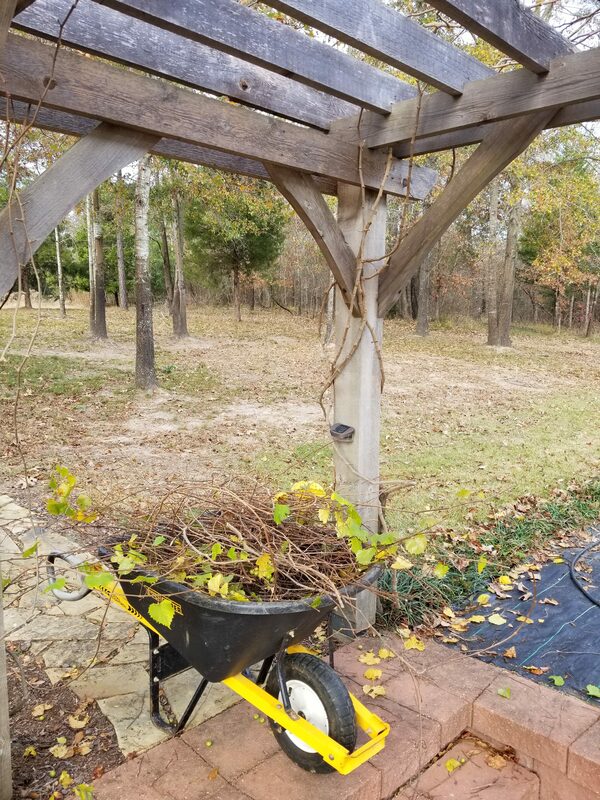 As I was pruning back my own muscadine vines this Fall, it occurred to me that in addition to making delicious, healthy treats, they also make a pretty apt metaphor for business. Aside from my annual pruning attack with the Fiskars, the muscadine grapevine doesn’t let anything stop it from growing. Think of it as the honey badger of the fruit world. If there’s one quality I’d say is required for business, it’s tenacity… the ability to stick around long after most people would have folded and run away seeking an easier, more comfortable environment. Tenacity can take on many forms but at the heart of it all, it’s about maintaining an unswerving commitment to growing your business no matter what comes flying at you… just like the vines that command my attention each Fall with their unyielding growth. Here are nine lessons we can learn from my brambly, tough old grapevines. The Muscadine is a Southern vine, preferring mild climates. That may be true, but it’s still hardy, given its ability to survive in bone-chilling temperatures down to 10º… something most true Southerners cannot claim. Swimming against a tide of misinformation while dealing with the day-to-day challenges of building a successful practice can make many want to quit. Successful advisors aren’t immune to these conditions: they rise above them because they are tough and tap into a bigger vision. Muscadines are commonly propagated by layering, as cuttings root with difficulty¹. Businesses thrive when their owners adopt a teamwork mentality. Nobody does their best work when you just throw them in the ring with no support (like a cutting thrust into the soil with no support network of vines). Reach out to people who can help you become a better advisor and always look for a community that reflects your values and principles. Promote the formation of straight shoots, since the shoot will harden and become inflexible as it matures². Maintain a flexible, open-minded culture with your business and don’t let stale ideas and methods take over, curtailing your growth. The success of your vine depends in great part on your pruning skills³. Successful business owners are good at taking a hard look at things and relentlessly pruning out what’s not working. Focus on your strengths. Muscadine grapes can tolerate a very wide range of soil conditions². Sometimes being tough isn’t enough: you need to adapt. If what you are currently doing isn’t producing the results you’re after, what can you change to keep growth happening? In most cultivars, the grapes in a given cluster ripen at different times and must be individually picked¹. A one-size-fits-all vision statement for your business won’t help you or your employees grow. Give proper credence to your vision and if you have staff, make sure everyone in your company is vested in those ideas… in their own unique ways. Muscadines need a vertical support on which to grow³. No business exists in a vacuum. Choose the right partners that will help you grow and reach your goals. Whether it’s outsourcing or aligning yourself with a movement, don’t be afraid to reach out and form connections with other businesses that offer you the chance to realize your potential. One reason for the popularity of muscadine grapes is that they are a sustainable fruit crop in the southern United States. They are tolerant of insects and disease pests, and homeowners can successfully grow muscadine grapes without spraying any pesticides. Growth is essential, but growth that’s not sustainable won’t set you up for long-term success. Are your methods based on sound principles that tie in with your vision? Annual pruning must be severe to keep new fruiting wood coming and to prevent vines from becoming tangled masses of unproductive wood¹. Every business deserves someone at the helm who is guided by a compelling vision, mission, and purpose. Don’t shy away from pruning out unproductive behaviors and processes that are not supportive. Everyone has what it takes to be tenacious like a grapevine. For financial advisors, tenacious growth can translate into helping even more people. And that brings about the best possible scenario of all: helping our clients grow into the best version of themselves and helping them to keep learning every day.